Meet Kate Malone-straight A science and math geek, minister's daughter, ace long-distance runner, girlfriend, unwilling family caretaker, emotional avoidance champion. Kate manages her life by organizing it, as logically as the periodic table. She can handle it all-or so she thinks. Then, like a string of chemical reactions, everything happens: the Malones' neighbors get burned out of their home and move in. Because her father is a Good Man of God (and a Not Very Thoughtful Parent), Kate has to share her room with her nemesis, Teri Litch, and Teri's adorable, troublemaking little brother. And through it all, she's still waiting to hear from the only college she has applied to: MIT. Kate's life is less and less under control-and then, something happens that blows it all apart, and forces her to examine her life, self, and heart for the first time. 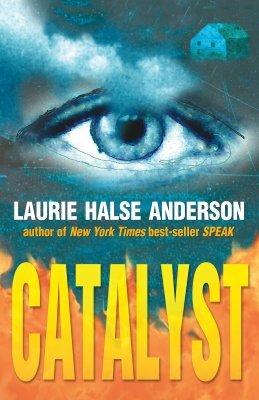 Set in the same community as the remarkable Speak, Catalyst is a novel that will make you think, laugh, cry, and rejoice-sometimes at the same time. Laurie Halse Anderson has received both the Margaret Edwards Award and the ALAN Award for her contributions to young adult literature. She has also been honored by the National Coalition Against Censorship in recognition of her fight to combat the censoring of literature. She is the author of the groundbreaking National Book Award finalist and Printz Honor Book Speak. She is also author of the critically acclaimed YA books Prom, Twitsted, Catalyst, Wintergirls, and The Impossible Knife of Memory. She has also authored a number of middle grade titles including The Vet Volunteers series, and the historical fiction Seeds of America Trilogy, which includes Forge, ALA Best Book for Young Adults Fever 1793, and the National Book Award finalist and Scott O’Dell Award-winner Chains. She and her husband live in northern New York State. Follow Laurie on Twitter @halseanderson and visit her at madwomanintheforest.com.